The challenge was exhilarating – orchestrating the brand’s most influential redesign project in 113 years! The objective? 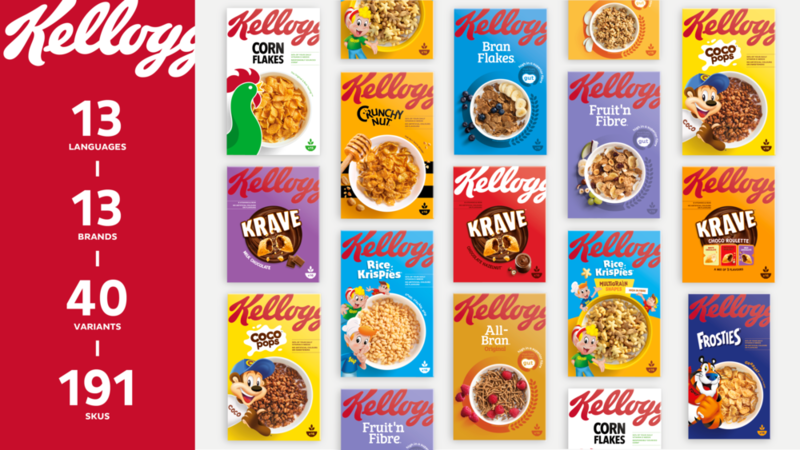 To proudly return Kellogg’s to its status as leader of the cereal category across Europe, whilst helping create a coherent portfolio with an iconic and instantly recognisable look and feel. Kellogg’s strategic design partner were tasked with developing a contemporary design that would bring greater clarity to the packs, and make it simpler for consumers to navigate on shelf. A redesign of this scale, size and complexity required intense levels of care and consideration, both from a crafting and technical perspective, in order to ensure a successful roll-out. To deliver the iconic new packs across Europe and the Middle East, Kellogg’s needed a conscientious brand guardian to meticulously oversee the whole design-to-print process. Bridging the gap between the strategic design agency and the production agency, our approach seamlessly amplified the original brand vision right through to production. From receiving the strategic intent, along with initial guidelines, we developed the toolkit consisting of packaging design masters and assets covering a variety of markets, variants, formats and sizes for all 13 brands within the portfolio. All were meticulously created and crafted in line with the global brand standards. This innovative Adaptive Design solution enabled Kellogg’s to make cost-savings across the whole process, by allowing the partner agencies to focus on their core expertise. It also ensured that the new pack designs reached market quickly and cost-effectively – without compromising the original brand integrity.